Chocolate Secret is a level in the game Super Mario World. It is in a subterranean location that overlooks the Valley of Bowser and is accessible via Warp Pipes from Chocolate Island after finding a secret exit in Chocolate Island 2. Many Chargin' Chucks occupy the area, kicking footballs to hinder Mario or Luigi. Mario has 300 seconds on the timer to complete this level, and it consists mainly of an underground area, where lava becomes a hazard early in the stage. If Mario completes this level, he gains access to Wendy's Castle, skipping most of the levels in Chocolate Island. 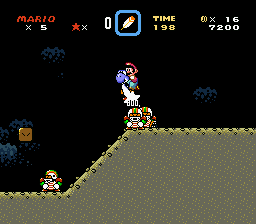 Mario begins the level near a Jumping Board on top of a Block right above the lava, where a Blargg waits, hidden in the lava, to attack Mario when he approaches the Jumping Board. The level starts out already dangerous, as Mario can fall in the lava if he keeps going to the right. A corridor with two Buzzy Beetles follow this and as Mario crosses this corridor, he is attacked by Chargin' Chucks, kicking footballs at him. Dodging the Chargin' Chucks and avoiding pits, Mario must continue through the level, eventually finding a ? Block containing either a Super Mushroom or a Cape Feather, depending on Mario's current form. Nearby the ? Block is a green Warp Pipe. This pipe leads to an above-ground area with an Amazing Flyin' Hammer Brother and falling Platforms over a bottomless pit. At the end of that area is a yellow Warp Pipe that leads back down into the main underground area. Another Chargin' Chuck attacks Mario with footballs as he approaches a green Warp Pipe. Mario can find the Midway Gate of the level once he passes through an area with two Chargin' Chucks. The nearby green Warp Pipe brings Mario to the second area of the cavern, where he can defeat several Buzzy Beetles by sliding down the slopes and avoiding a small pit with a few Munchers, to the bottom of the cavern, where another green Warp Pipe takes Mario to an area with Spike Tops, and yellow platforms bobbing in the lava. Once Mario steps these platforms, they start to sink in the lava, forcing him to run and jump from platform to platform until he reaches solid ground. Several Chargin' Chuck appear here, as well as a ? Block. Mario eventually finds another row of yellow platforms in the lava, leading him to the only Dragon Coin of the level. Ahead of this area is a Warp Pipe that leads Mario to the Giant Gate. Chokorē-tō Himitsu no Kōsu 1 Chocolat Island Secret Course 1 (actually a portmanteau between ｢チョコレート」 chokorēto (chocolate) and 「島」 -tō (Island, as used in names)). This page was last edited on April 9, 2019, at 02:59.